One of the most famous paintings of all time will be revived for all the world to see. 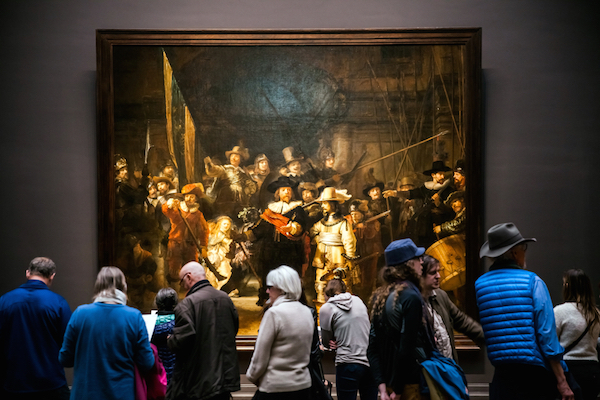 In its greatest restoration project ever, the Rijksmuseum will be breathing new life to Rembrandt’s 1642 masterpiece, The Night Watch, under the noses of visitors. The 12.5 x 15-ft artwork, which weighs an impressive 743 pounds, will sit inside a “state-of-the-art glass chamber” on the museum floor throughout the process. The museum will also live-stream the restoration for anyone in the world to enjoy. “The Night Watch is one of the most famous paintings in the world,” said Taco Dibbits, General Director of the Rijksmuseum. The entire process is expected to take years, as well as bountiful financial resources, before seeing completion. Rembrandt broke stereotypes surrounding group portraits in the Dutch Golden Age. Whereas most artworks portrayed people standing or sitting in designated areas, the artist incorporated movement and action into his masterpiece. He also played with lighting in his painting, which has since become study material for modern-day art students. The project will commence in July 2019. You can learn more about the restoration here.